We all love to take our pets with us when we can. And we’ve all seen dogs riding with their heads out the window, clearly unrestrained in a car. Maybe we’ve even done that with our pets. They seem to love the air rushing past their muzzles. 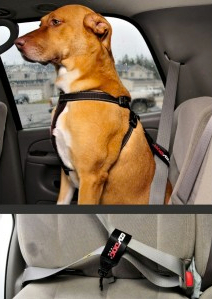 But it’s important to be sure that our dogs are safely restrained in a doggy seat-belt restraining device. What might seem harmless could actually become life-threatening for the dogs in even a minor accident. Many people use dog car crates for in cars, but a pet that’s well-behaved enough to not cause problems or panic if placed in the seat can be safely restrained with a harness and dog seat belt restraint. There are some other tips than can help make car travel with your dog safer, as well. First, put your dog in the backseat instead of the front, and make sure to use a good dog car harness. There are several good reasons for doing this, even though it might seem more fun to have your dog next to you. Most modern cars have passenger side airbags. Children under a certain size must sit in the back because of the danger of injury from an inflating airbag, and dogs can suffer the same types of injuries. They’re simply not safe in a seat where an airbag might suddenly inflate. In the event of an accident, a dog sitting in the back farther away from the windshield is naturally safer than one sitting close to it. And there’s also the issue of driver distraction. Even secured with a dog harness and dog seat belt restraint, a pet in the front may be able to reach or distract you while you drive, which is dangerous for everyone. Rolling a window down can keep the car cooler and the air fresher, but be sure the window nearest your dog isn’t down too far. 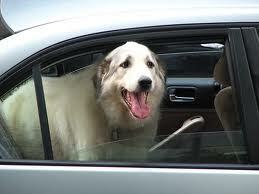 Dogs can actually become injured by hanging their heads out the window by bugs or anything airborne that strikes them. They can also try to jump out a window, or get caught. Imagine a dog leaning out a window and putting its paw on the device that rolls it up, and it’s easy to see how dangerous this could be. If your dog is properly restrained, it probably can’t get into this situation. But if your car has a backseat window lock for child safety, use it while your dog is with you. If you don’t like the idea of your dog in the back, just remember to speak to your dog in a soothing, happy voice. Talk to your pet often and give praise to keep him feeling noticed and calm. This will help ensure a safe, fun trip in the car for everyone. For more doggy fun check out the EzyDog website!